Left click the Order Form Box for prices. Left click the Video Link box below to see the very simple set-up process. 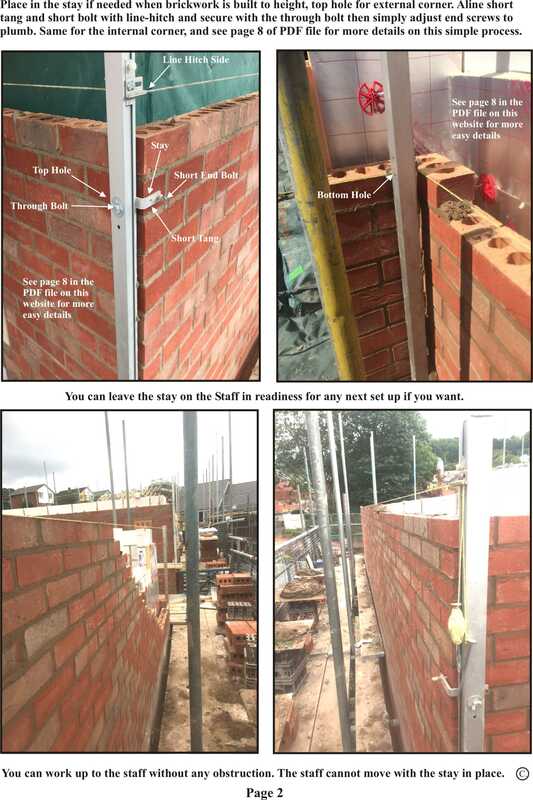 You can see on the close up picture of the clamp that the four 6mm adjusting screws ends do not protrude through the clamp at set-up, is in order to allow the inner face of the clamp to meet flush with the brick face before any adjustments. Left click the Order Form box below for prices. Welcome to APT. Our Specialist Tools have won first places and design awards and are the leading way for most tradesmen. We take great pride in knowing that our tools are proven to be the best in their field. Design and Copy Rights are in place and current Patents are applied for. 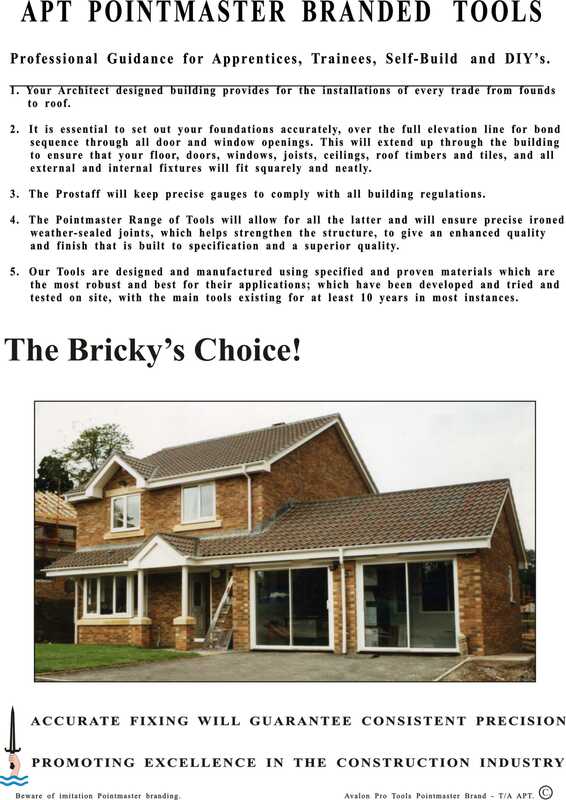 PRO-STAFF X Professional Bricklayer Profiles will allow you to build most constructions. PRO-STAFF X We can crop the Staffs to a shorter size for carrying in the car boot, if wanted. 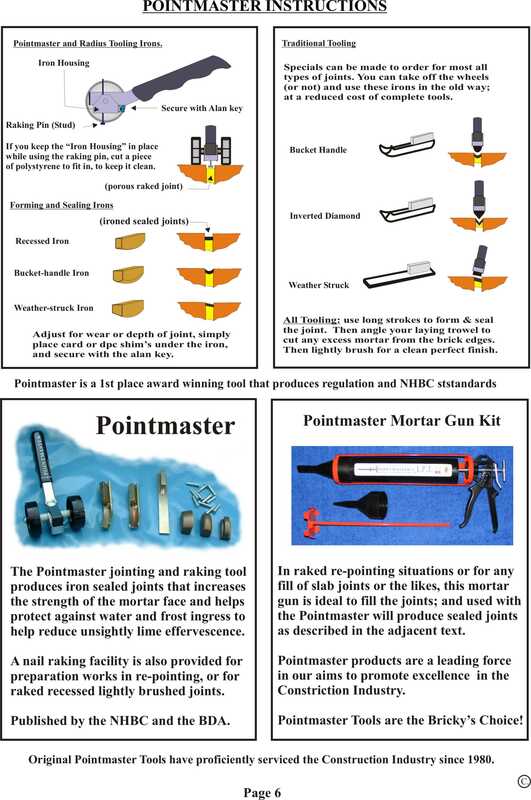 POINTMASTER (and Mortar Gun) allows for joint-raking and all forming irons. THE JAK BRICKLIFTER is designed lightweight for ease of use. 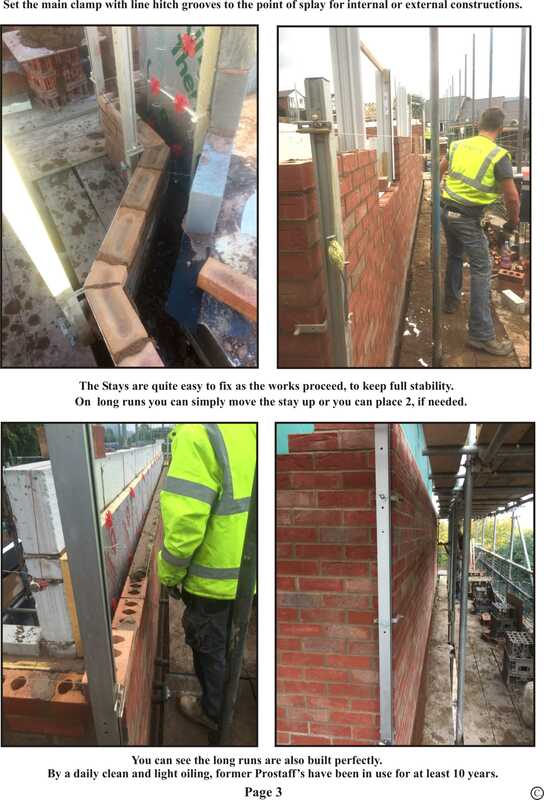 Our bricklaying tools are specified standards in most countries, which are illustrated in the BDA publication "A Guide to Successful Brickwork" and are approved by the NHBC. raking and finishing, one will last for the jointing of about 10 houses. 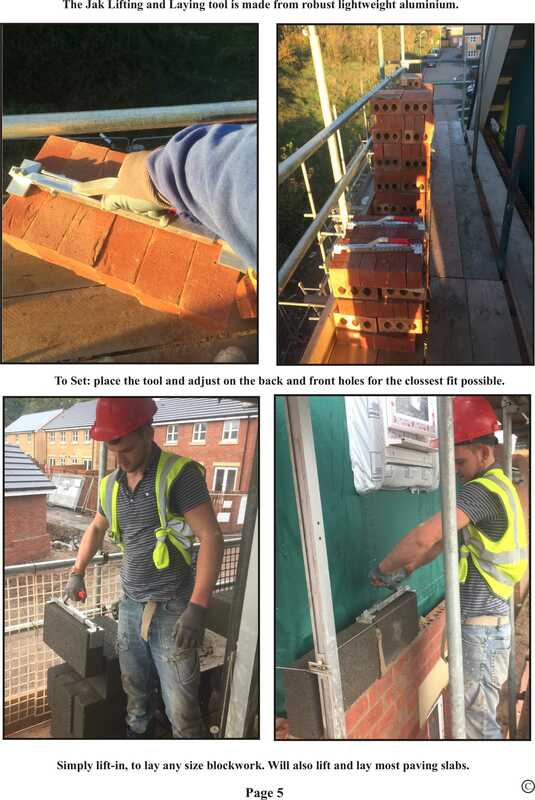 In the initial learning of using the level to construct any brick, block or stone feature, will build confidence and skill in any apprentice or trainee. 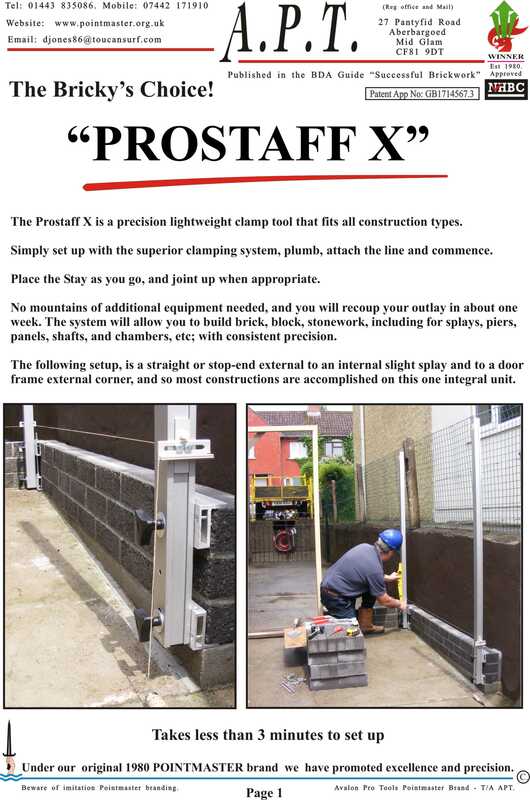 Our new Prostaff X will also allow apprentices to learn and adopt such system before they embark onto the building site. 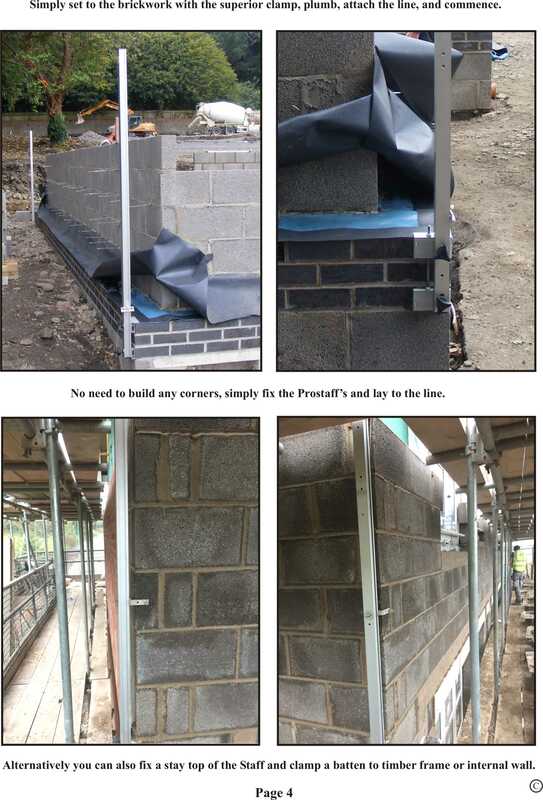 Our Prostaff X will fit all types of wall constructions (without any need for mountains of additional or extra equipment), it is easy to set up and use and has become the preferred integral self stabilized lightweight robust bricklayer’s profile, that provides a consistent precise standard for anyone who uses them. The Prostaff X has become “THE PROFESSIONAL BRICKY’S CHOICE”!